Videoconference anywhere to any device with our portable solutions. Flexible, on-the-go, professional portable videoconferencing to Polycom, Lifesize, Tandberg, PCs, Macs, tablets, phones, and many other devices. Lake Cook Reporting has always been at the cutting edge of technology in the legal field. We’re proud to introduce that next step: portable videoconferencing. We’ve simplified the unknowns when it comes to existing portable videoconferencing solutions: Do I need the right equipment? Can I video conference without a WiFi connection? Do I need to have special equipment to connect? Our solution is simple: provide easy to deploy hardware and software and take the complexity out of portable videoconferencing. Schedule deposition services with Lake Cook Reporting. For Video-Only Scheduling without Court Reporting, Click Here. We Listen To You. Portable videoconferencing in your office. Tablet systems and full video conference setups available. We’ve removed the need to jump through hoops to setup equipment. On the day of the deposition, our trained court reporters setup pre-configured laptops, tablets, or other video conference systems. Each device comes equipped with cellular internet capabilities, allowing high definition calls over a 4G LTE network. Rather than fumbling around with WiFi codes or convoluted connection steps, each portable video conference unit is setup and ready to provide high definition video conferencing wherever there’s a stable cell phone connection. Portable videoconferencing interfaces with video conference systems, computers, tablets, and more. The advanced hardware is only half the equation. Beyond cellular-equipped video conferencing units, our systems run advanced video conferencing software for any scenario. Clients who want the convenience and quality of a video conference room system such as Polycom and Lifesize can connect to our portable devices. Attorneys and witnesses looking to avoid the cost and travel involved with a room system can use any PC, Mac, Android phone/tablet, iPhone, iPad, and more to connect at the push of a button. No dialing required! 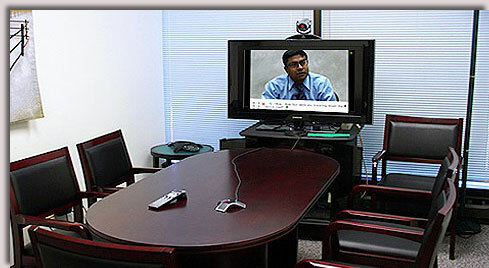 Our systems also work with any video conferencing software. If you prefer, our units can run Skype, FaceTime, Zoom, WebEx, or any program that can be installed on iOS. OS X, or Windows. Portable videoconferencing available anywhere with an internet connection or cellular service. While our devices can interface with wireless internet, we know this option is not always available. Courtrooms, hospitals, and other locations often have private networks or no networks at all. With our advanced cellular internet, we provide high speed connections over the cell phone network at no extra cost to you. Our clients don’t have to worry about bandwidth, data caps and costs, or anything else. Affordable portable videoconferencing without sacrificing quality. 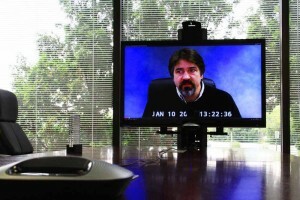 We take every measure to ensure that our video conferences are of the highest quality. Our equipment all records in high definition, our video conference network is high definition-ready, and our wired, wireless, and cellular networks all support the minimum requirements for high definition calling. To make video calls in standard definition, our equipment requires a minimum speed of 384kbps upstream and downstream. For high definition, the minimum requirements are 1.5mbps upstream and downstream. In most cases, our cellular connection speeds are well over 50mbps upstream and downstream, ensuring high definition video calling under normal calling conditions. Please note: signal strength and network conditions may affect call quality on all networks. Our service won’t cost you an arm and a leg. Clients using our service only have to pay a reasonable setup fee, which we discount when using our court reporter. Perfect for witnesses and attorneys who can’t travel. Many of our portable video conferencing units are low profile, meaning they don’t require advanced technical skills to setup and operate. Because of this, our solution is perfect for non-technical witnesses in need of portable video conferencing who for whatever reason can’t travel to a video conference site. Witnesses who are confined to a home or even a bed can have a portable unit setup near them with little effort. Our company also offers cellular-equipped iPads that can be mailed anywhere in the country. Simply request a device, we’ll mail it, and return it to us after the conference. Thank you for reading this post! To celebrate the launch of our new service, we’re inviting clients to try this new service. Mention this blog post and you’ll receive a 10 percent discount on your first portable video conference. Feel free to inquire about portable video conferencing by contacting us today. 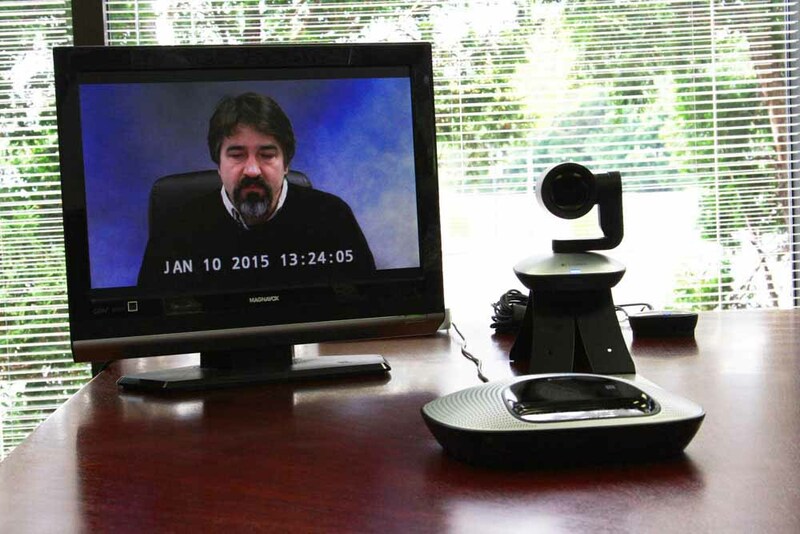 Feel free to schedule a portable video conference when ordering a court reporter. Simply select “Portable Video Conference” under Additional Services on our scheduling page.